Today, I’ll be showing you how to use keywords in your website. Properly I might add. We all know that proper keyword choice along with correct usage within your content will bring the much sought after traffic to your website. Which always brings a smile to website owners faces. The number #1 rule in proper keyword placement is not to overload them all over your webpage. Trying to pack keywords in every available spot you can. This used to be the old way of SEO back in the day, but now with Google frowning upon this strategy. So, you ask, “How many times should I use my keyword(s) in a post?” Well, Grasshopper you shouldn’t have used it more than 3 times, like a pyramid. Wait…whaaaattttt? Yep, 3 and only 3. In my mock page demonstration below, check out my randomly thought up keyword. Gordon Liu. Well, maybe it wasn’t random!? My strange agendas. I mocked up a page to demonstrate how to correctly use a keyword. I only used the keyword (Gordon Liu) three times. 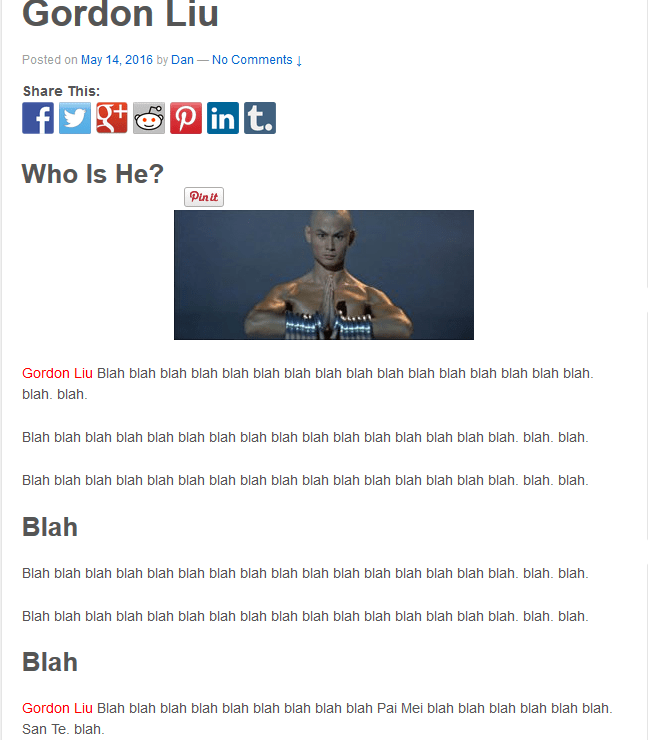 Notice the Page Title (Gordon Liu). Then highlighted in red two more times. One in the first sentence or paragraph then once again in the last paragraph. So easy. I know right? Example of How Many Times To Put KeyWord in Page. DO NOT PACK THE KEYWORD INTO YOUR CONTENT!!!! Write naturally, and it will just work better, focus on your audience and make it easy for them to read and for the information to help them. Put yourself in their shoes and then write to help them. It’s a skill and can be honed. Not that I am great or anything, but I had a hard time in High School writing any, even one sentence. Not kidding. You can get a lot better with practice. Focus on having GREAT CONTENT! If you happen to write naturally and the keyword comes out organically, go with it. But by no means revert to keyword stuffing. How do you choose the correct keyword? Well the method I use, it’s honestly, kind of fun and very rewarding. Did I forget to mention it’s super easy too? Yeppers. A side note here, whenever you find something that’s easy and fun and beneficial, grab that sucker by two hands and don’t let go. This is the case with the keyword finder I use. I lean on this, to help me continuously. Well, what is the keyword finder? A Keyword finder is a program that helps you find low competition keywords, which helps bring traffic to your site. Ideally, you want to choose words that receive a lot of traffic but has low competition, thereby guaranteeing you the ever sought after traffic to your website. The program I use is Jaaxy. You can read my full review of it here, What Is Jaaxy About?. I am currently a Pro member, and I pay a monthly subscription price of $19.00. It’s so worth it. You can test drive it for 30 free searches with a free account, basically, to take it for a test drive. Just create a free account and see how useful and easy it is. There is no need to enter your credit card information or any of that funny stuff. Just name, email, and password for the free 30 searches. If you happen to sign up for Jaaxy, you will be surprised at the value it adds to your affiliate marketing and SEO techniques. I know Jaaxy is that good and I highly recommend it. Try and see it for yourself. Practice these keyword techniques and watch your rankings steadily improve. Keep posting at least once or twice a week, and you will be rewarded with website traffic! Comments and Questions are always welcomed at HighlanderMoney.com. I would love to answer any and all questions. Thanks! ‹ Does ShoeMoney (Blog Ninja) Work?